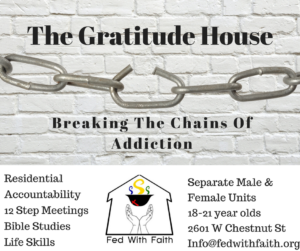 The Gratitude House Transitional Living Recovery Center located at 2601 West Chestnut Street Louisville KY. The building will be up and running November 2016. This building will house 15 clients in their own rooms who have been successfully discharged from a detoxification center. They will have a two week scholarship to find employment and two more weeks to start paying rent at $85 a week. We lease a common room downstairs for clients to attend AA meetings, NA meetings and bible studies. The model for the recovery living center is based on our founders experience getting of the streets and sober himself. He was given the opportunity to live in this type of model in June of 1999 and as of 2016 is enjoying 17 years of continuous sobriety. We feel that this approach gives our clients the safety of working through issues of living clean and sober yet having the support of a community that lives drug and alcohol free. We will give every client the opportunity to live within the community with guidelines and responsibilities to the house itself. Random drug and alcohol testing will be done to keep the community safe. Clients who are found using will have a chance to go back to detox and come back with certain restrictions and requirements. Daily readings and meditations will be encouraged to create a spiritual environment conducive to recovery. Our goal is that every client who walks through our doors grows and develops a relationship with a Power greater that they can rely on and find a better way of life with. If you would like to help by making a donation you can go here to donate through our website, visit our GoFundMe page, or send donations to our mailing address (Fed with Faith Inc. – PO Box 6961 Louisville, KY 40206). Fed With Faith is a registered 501c-3 so all donations are tax deductible.